Ford has announced it is recalling roughly 6,500 model year 2013 vehicles in North America due to a child safety lock problem. The recall affects 2013 Ford Focus, Escape and C-Max vehicles that may contain an incorrectly installed rear door child lock. 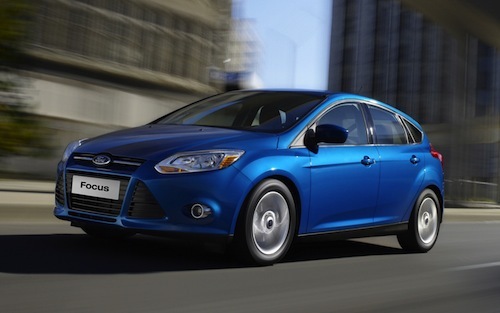 Ford says that the safety recall concerns 5,675 vehicles in the United States and 859 in Canada. There have been no reports of crashes or injuries related to the recall, according to the automaker. The affected vehicles were manufactured from Nov. 16-21, 2012 at Ford’s Michigan Assembly plant. According to documents filed with the National Highway Traffic Safety Administration, "The child lock may not engage when the operator uses normal turning force to activate the child lock, and the operator may incorrectly believe the child lock is engaged." Ford first became aware of the child safety lock issue on Nov. 20 at its Wayne plant. Upon discovering the problem, Ford launched an investigation. The automaker later discovered that a Tier 3 supplier had shipped a mixed stock of parts, which led to the problematic latches. Ford will begin notifying customers of the recall later this month. Authorized dealers will replace the rear door latch. In the meantime, Ford Focus, Escape and C-Max hybrid owners can contact Ford at 866-436-7332 or visit the Ford Recall Notices website. Concerned drivers may also contact the National Highway Traffic Safety Administration’s Vehicle Safety Hotline at 1-888-327-4236 or online at www.safercar.gov. Although Monday’s recall marks the first time the 2013 Ford C-Max hybrid has been recalled, the same cannot be said for the 2013 Focus sedan and Escape SUV. In October 2012, Yakima Products Inc. recalled certain 2013 Ford Focus sedans because they may contain faulty rooftop racks. Aside from the minor Yakima recall, which affected 440 vehicles, the 2013 Ford Escape was involved in several substantial recalls last year. In fact, the 2013 Escape was recalled four times last year, three of which were fire-related. In July, Ford recalled 11,500 Escape SUVs equipped with 1.6-liter engines over fire concerns. According to the recall notice, the root of the problem was a damaged fuel line. Just two months later Ford recalled the 2013 Escape for a second time due to fire risks. This time around the fire dangers were the result of an improperly installed part, which may result in coolant leakage. Consequently, the loss of coolant may spark a fire when in the presence of a hot engine. The recall impacted just over 6,000 vehicles. The third and largest fire recall was issued in November, and concerned more than 73,000 Escape SUVs. According to Ford, the vehicles in question may suffer from engine overheating, which may lead to fluid leaks. As a result, the leaked fluid could ignite if it comes in contact with hot exhaust steam. In addition to three fire-related safety recalls, Ford recalled the Escape last summer due to a brake flaw. The recall, which affected 10,000 vehicles in North America, stemmed from incorrectly positioned carpet padding.